I adopted some planarians after they finished their “sitting in a dish for intro biology labs” duties. I also got a little female betta fish to keep them company. I liked her better than all the grumpy looking males at the pet store. So far I have fed the planarians a bit of hardboiled egg yolk, they have been swarming over it for a few hours now. Seems like it will be fairly simply to keep them happy. Have you ever kept planarians as pets? Any tips or suggestions? The Bug Girl herself stopped by my office yesterday, and gifted me with what I now consider one of the greatest books EVER. It doesn’t look very exciting… a big, old, gray book. 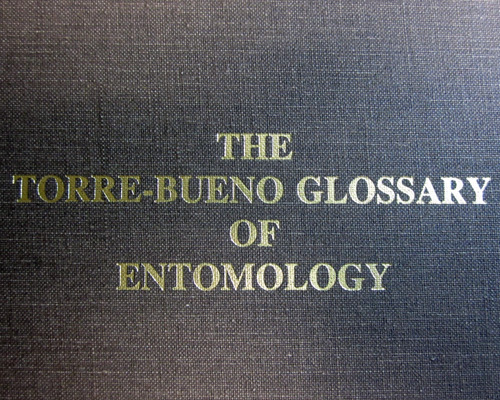 But it contains over 800 pages of entomological terms and definitions… a gold mine! Bet you can’t guess the first one I looked up? Honey, if you are reading this, I expect you to comment. 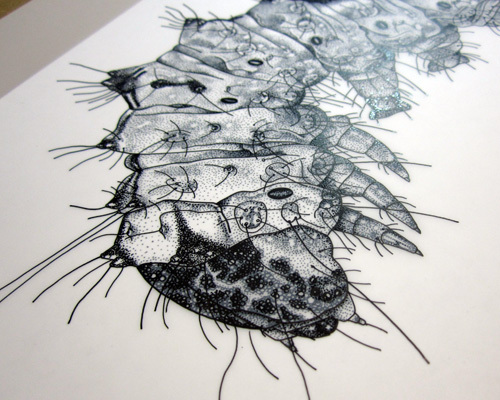 My Acronicta falcula illustration is nearing completion. You don’t get to see the whole thing until it is finished! Here is the result of previous activities in the lab. This is just a small sampling. We have had an exciting week here in the caterpillar lab, due to the emergences of some impressive saturniid moths. 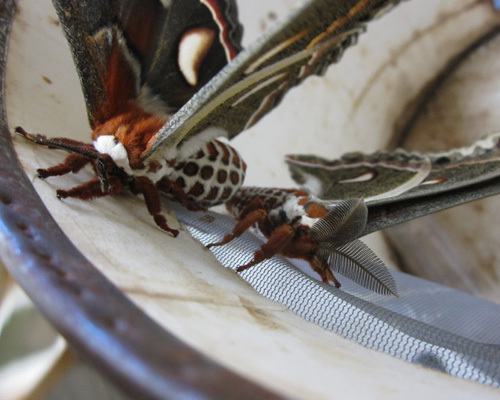 Several cecropia moths (Hyalophora cecropia) emerged from their cocoons we had kept as a bouquet of twigs on the lab table. When left to their own devices, well, they didn’t waste any time. When you are a non-feeding moth, all of your energy goes into that single task that defines your existence. I’m excited to see some eggs and little baby cecropia caterpillars soon! When you accidentally pull down the rain gutter while trying to set up your sheet for black lighting, you need to come up with a new plan. I realized I have a clothes hanger thing I never use, so I set it up on my porch and draped the sheet over it, securing it with clothes pins. I then used my garden hook (formerly used to hang a bird feeder) to hang the black light in front of it. And I got moths! No Acronicta yet, but I am hopeful. 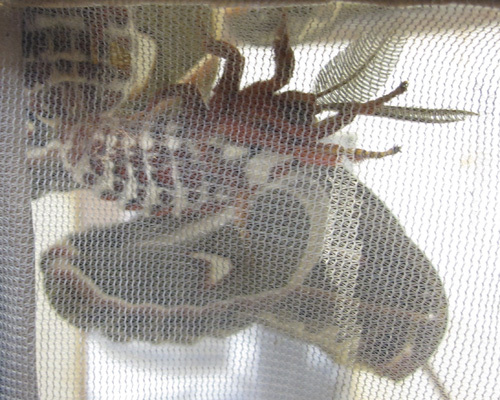 A giant water bug flew in late last night, making quite a ruckus buzzing around the sheet and my screen door. I put him (or her?) in a critter keeper with water temporarily, I might keep it as a pet. They do great when fed feeder goldfish from the pet store. 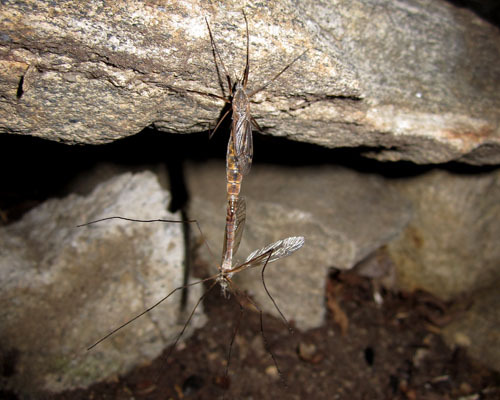 I also got quite a few large craneflies. I caught a few, uhh, in the act. 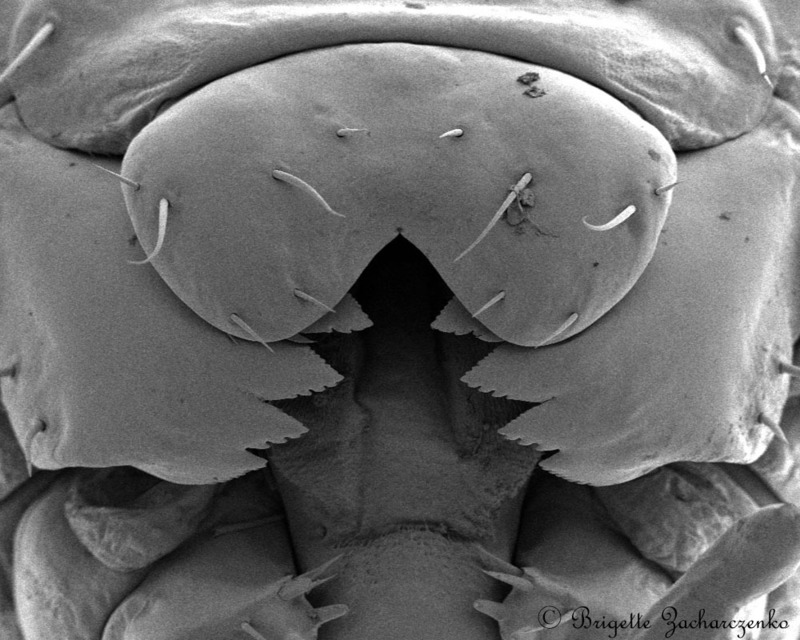 This will be a great addition to the book my friend and I are (half jokingly, half realistically) planning to write about insect mating positions. 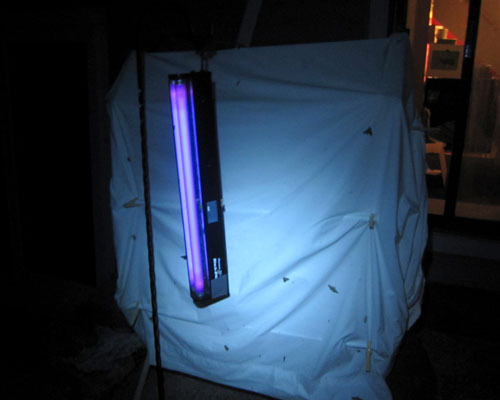 Do you have a black light set up in your backyard to collect insects just for fun? Do you go on black lighting trips to collect moths? 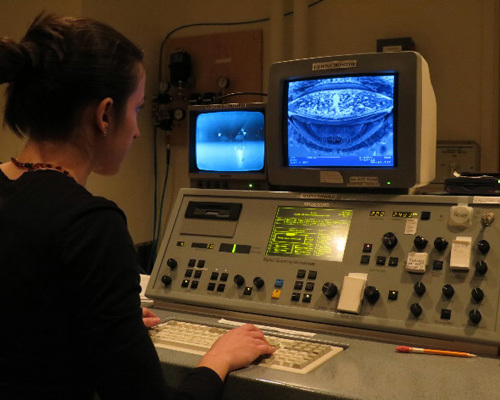 Do you enjoy the thrill of helping a graduate student with their research? If any of those apply to you – please read on! As a graduate student, I only have so much time and money. I am planning on a bunch of small collecting trips within driving distance this summer, and blacklighting at my apartment and forests around campus. It would help me tremendously to get freshly killed specimens from around the country (and around the world!) for me to use for DNA analysis. I have a few collaborators who are helping me by collecting female Acronicta species at lights and keeping them in plastic containers or deli cups until they lay eggs, and then sending the eggs on to me – that is also something I would be thrilled to have more help with. If any of that sounds like something you could help me with, please let me know by emailing me through my contact page! I can then give more detailed instructions. Even if you cannot identify the species, if you can tell it is in the genus, I’ll take it. You will of course be credited in the acknowledgements of any paper or presentation that involve the species you send to me. I could cover overnight shipment costs. Thinking about doing molecular work for my research is incredibly daunting. The more I learn in classes and seminars about how to collect and analyze DNA the more terrified I become that it will totally consume my life, and that won’t be able to handle it. But I am learning to slow down my wild imagination and take things one step at a time. 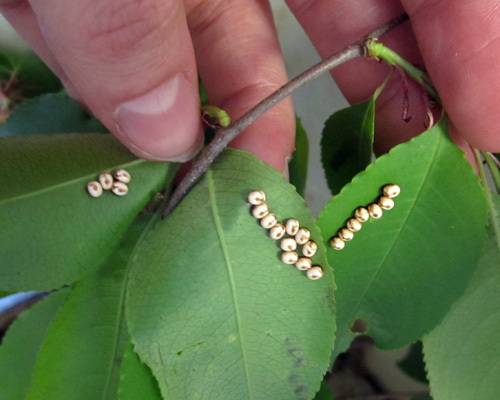 Step one – collect some specimens for DNA! Even this is not as easy as it sounds. I know how to catch moths and pin them… but what are the best ways to preserve them and preserve their DNA? DNA will start to break down if left out in the open. Extracting DNA from dried, pinned museum specimens has spotty success depending on how old they are. 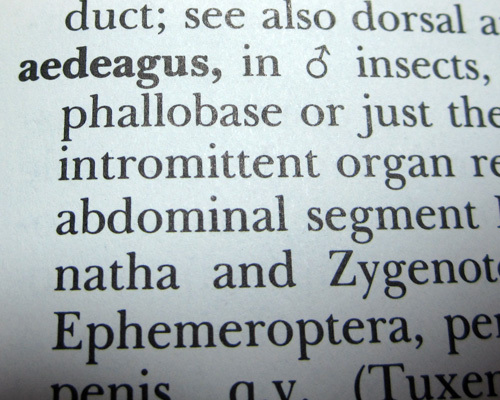 It is best if specimens are kept in ethanol (95% or 100%) and in a freezer (-20C to -80C preferable). Unfortunately, moths aren’t kept that way. They are pinned, spread, and left to try in glass-topped drawers. How they are killed also can determine the DNA yield – cyanide is the preferred killing chemical, as opposed to ethyl acetate. That is not something typically written on labels, so if you are working with someone elses specimens, you have to hope you get lucky. Ethyl acetate is much more common as it is safer and cheaper. An easy solution would be to take a whole moth and throw it into a vial of ethanol, and keep it in a freezer. However I still want to use my moths for morphological analysis (looking at wing patterns and body structures) so that wouldn’t work well for me. 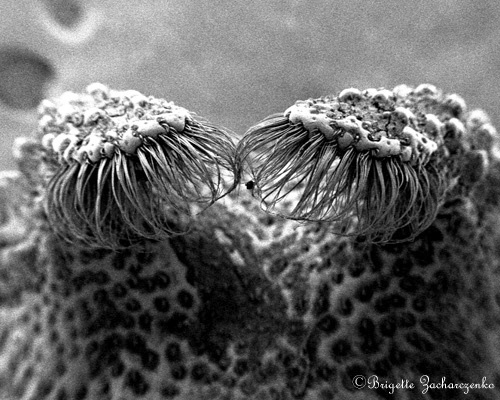 You can imagine that ethanol is not kind to delicate moth scales. My solution is to remove three legs from the right side (just to be consistent) of my moths. That means carefully sterilizing my equipment between each use to ensure there is no contamination by stray scales or other body parts as I transfer the legs to their vials of alcohol. I am using little temporary tubes for now, and will move them to glass vials with proper labels soon. Luckily, legs are not as important for the analysis of moth specimens, so I am hoping some collections will let me take samples from their museum specimens to supplement my research. 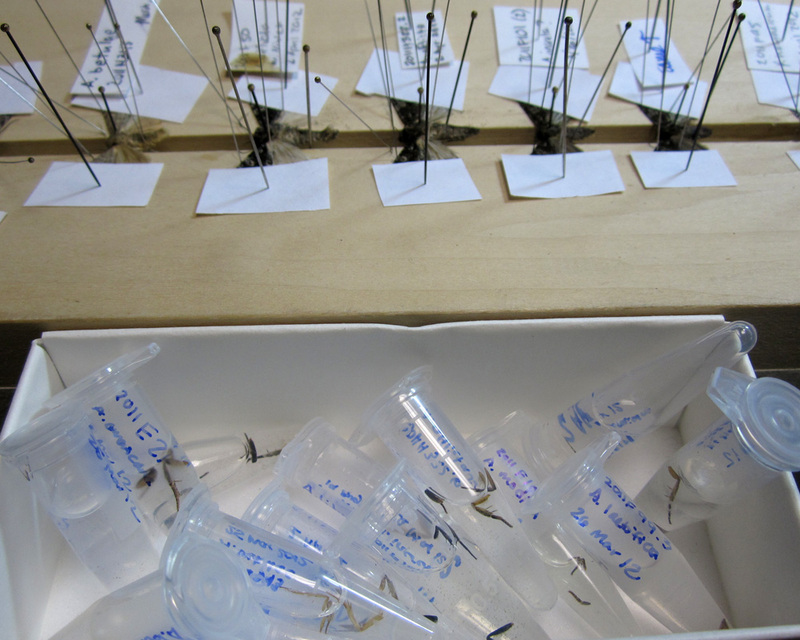 Here you can see my first set of leg specimens, alongside the pinned moths. These are all individuals I raised from eggs last summer. And what about the caterpillars I have kept in ethanol? Those could be useful too, however in many cases it is more difficult to accurately assign an ID to a caterpillar, and it is more difficult to remove a tissue sample for DNA without destroying the specimen. I will probably use some of them, especially in cases of cryptic species complexes. Now I am anxiously waiting to see which moth will emerge from its pupa next… I still have a few dozen left.